At the base of Practically Perfect is a stubborn desire to do things ‘right’. To guarantee that all products are free of gums and resins and other chemical treatments as much as possible, and if they are treated, that the chemicals themselves are noted in the product descriptions. I believe in having that kind of attitude towards my accessories, because we now have so little power over what our clothes and jewellery are treated with, that it’s really nice to actually have an informed choice. In addition, nobody likes to run into someone else who is wearing the same items or the same outfit; it’s a massive faux pas in any circle, and there’s always at least one person who doesn’t look as good in it. This is the sad side of wearing mass-produced jewellery, and by buying unique pieces of jewellery from artisans instead of chain stores, you, the potential customer, get to avoid any embarrassing situations in the future. 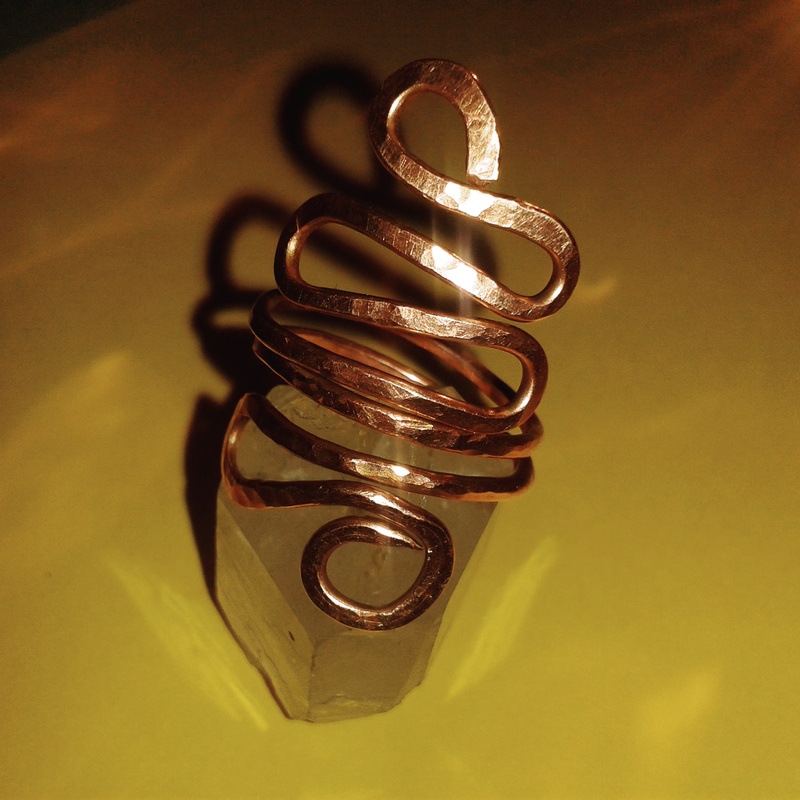 Wirework jewellery has been worked for thousands of years. Some o f the beautiful antiquated treasures that have been found to be Copper Age are quite similar in style to the direction I’ve gone, and that strengthens my resolve to keep things natural. 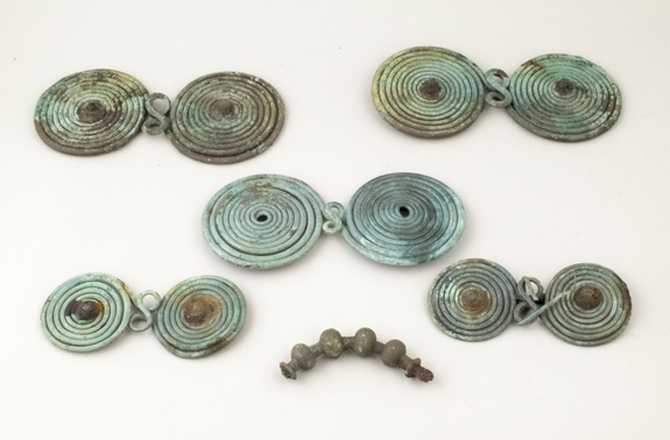 These items in this image are bronze, which is an alloy of copper and tin. They date back to the Bronze Age, and were found in Southern Transylvania, in Romania. See the link for more details. It’s also important to remember the people who will eventually wear the pieces. Giving people a choice is a good thing because everybody’s different. Copper seems almost alive, the way it changes colour through a slow oxidisation, and some people may prefer it that way. However, ‘antiqued’ copper is most in vogue, so it seems crazy to ignore that. For the moment I’m using Liver of Sulphur to tarnish some pieces. Liver of sulphur is a chemical treatment that gives the finished piece definition; you feel like you can see it better. At full strength it turns the copper a kind of black-grey, but this is then polished off so that it only remains in the crevasses. Because I’m a student of the craft, I’m finding that I’m making a lot of beautiful, very wearable jewellery … a lot! Jewellery needs someone to love it and wear it, and honestly, I can’t wear everything! I’m already dripping in copper rings, bangles, necklaces and earrings! You get a lot of jewellery for your money, so provided it is looked after, my jewellery will prove to be great value and hopefully something special. Feel free to browse my shop and let me know if there’s something you like. If there’s something extra special that you would like me to make for you, just drop me a line at my email address: CopperAndCoils *at* gmail *dot* com. Postage is quite simple: if I can get it all in a tiny Jiffy bag, you can have it in one parcel. It’s £2.80 postage (per parcel) to anywhere in the UK, and £4.10 to anywhere else, including Europe, the US and Australia. In any cases where the postage may be higher, such as for larger items, I will ensure transparency and let you know how much it is! [LINK] Come check out my shop for lots of lovely things!